When a person is given a clean bill of health after months of severe pain, worry, and surgery, the time is ripe to celebrate that freedom, and Mary and I did just that the other night. There were many different restaurants that we could choose from, but the noise level on all of them was just not conducive to a celebratory meal. (Why do restaurants have to be so noisy nowadays? Particularly those that are expensive, good food, and atmosphere?) We elected to go to “Solare” even though I have boycotted Liberty Station ever since it was given to McMillan on a silver platter. None the less – it was Mary’s celebration and we went where she wanted to go. We were early – just a few minutes before 5:00pm – but there were already people seated at the bar for their Happy Hour. We were shown to a table that was off to the side, private, but able to see the workings of the entire restaurant. We were introduced to Paula, who would be our waitress for the evening. And from the onset she was superb. She knew the answers to all of our questions; she was able to make suggestions; she described each entrée as we asked about it, and made our evening enjoyable. This mother of a 3 year old was patient, humorous, and fun. We originally thought we would start out with wine, but after looking over the drink menu changed our minds. I ordered a Garden Gimlet, replete with gin, cucumbers, basil, and lime. I wondered if it would be served with bleu cheese dressing, but it wasn’t. What it was was a cool, refreshing drink, very tasty, and quite large. Mary ordered a “dirty martini” but after a few swallows ordered a glass of wine instead. I didn’t want the martini to go to waste – think of those poor thirsty children all over the world – so I finished it for her. It was ok – nothing real special. 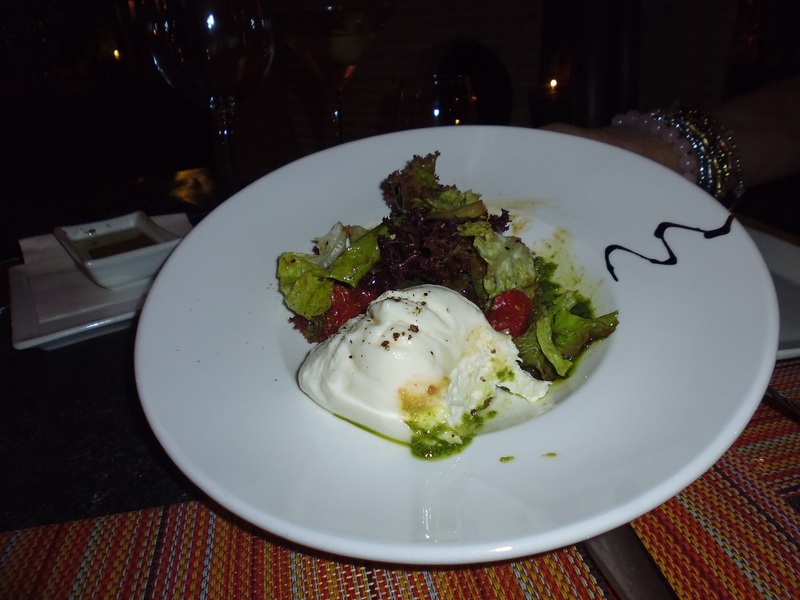 For an appetizer we ordered Caprese Solare, which was a gioia cheese burrata, with date and tomato confit, pine nut pesto and a balsamic glace. The cost was $12. It was very tasty; and we finished the entire thing. 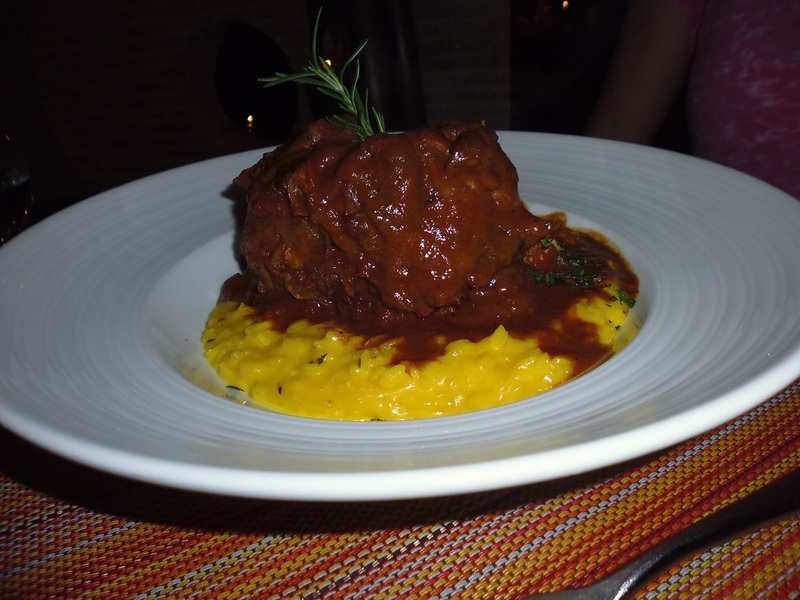 Mary ordered the Ossobucco di Masale – slow braised pork ossobucco, Milanese risotto and gremolada. The cost was $21 and it was well worth it. The pork was juicy; seasoned perfectly, huge – in fact she took most of it home – and it just fell off the bone. She would definitely order it again. I had some difficulty in choosing one of the several nightly specials. 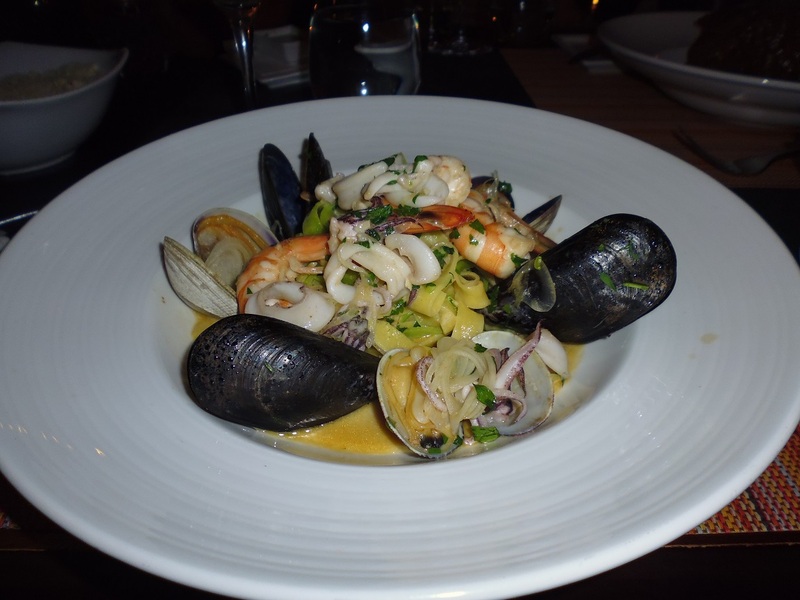 I could not choose between the Halibut – my favorite – cooked with crab and shrimp, or the Fettuccine cooked with mussels, shrimp, and calamari . I went with the Fettuccine, because it was an Italian restaurant and the pasta was freshly made. It was an excellent choice. There were plenty of all of the ingredients – including the mussels and shrimp. It was some of the best combinations that I have ever had. The cost was also $21. We also ordered a half order of the Gnocchi al Telefono. We think that maybe the cook was on the telefono a little too long, for the potatoes “stuck” together, were bland; Mary was glad she had not ordered the full order instead of the Ossobucco. As it was, we left most of it for it just wasn’t as good as the other two entrees. The half order was $9. Throughout our entire meal, Paula came back and checked on how we were doing. By this time the restaurant was full, and she had many tables to wait on. However, the service was good; our glasses were always filled; and we particularly liked the small carafe brought to Mary for a second glass of wine. Although we “shouldn’t have” we did look at their dessert menu and ordered a “Millefoglie crème pasticerra” . There were 1000 leaves of Italian puff pastry with a crème aralais and raspberry sauce in multiple layers. A thin raspberry sauce, and several fresh raspberries were on the plate also. The cost was $8. 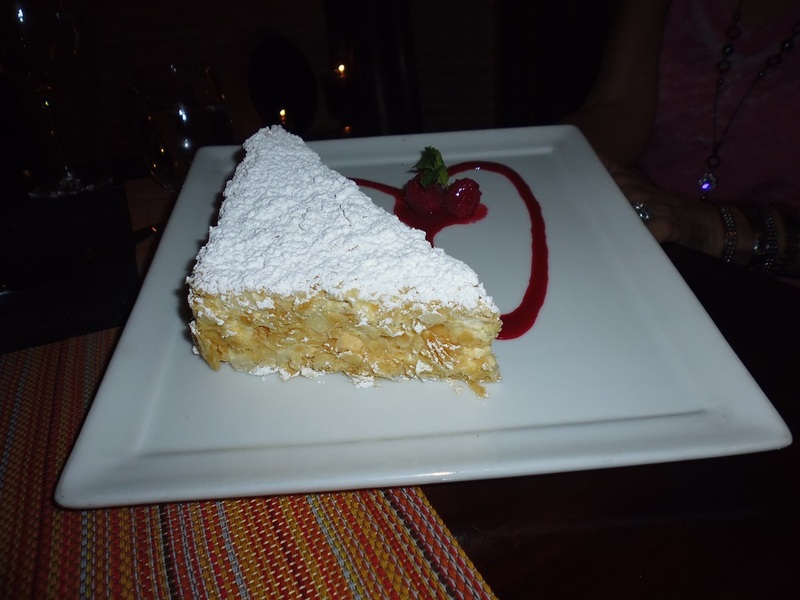 The taste was similar to “Napoleons” but without the chocolate. Would we go again. Yes, there is no question that we would do so. 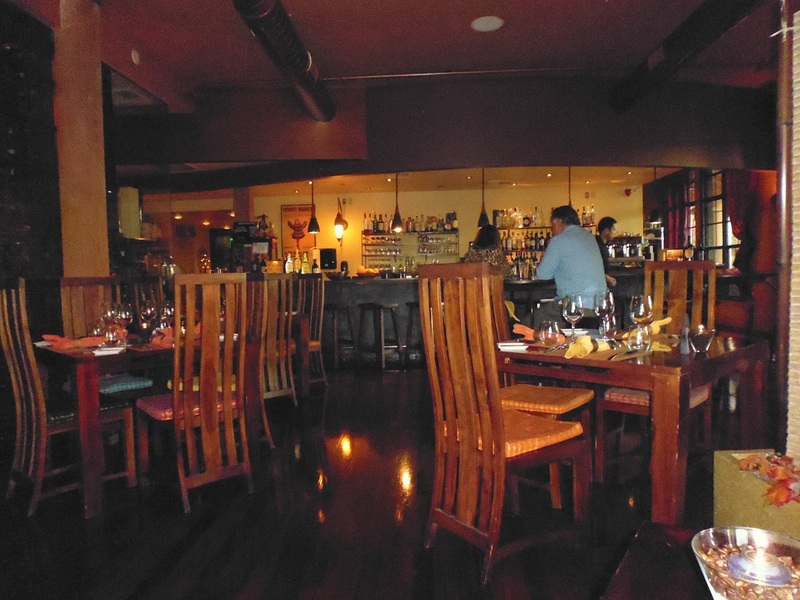 However, it was not an inexpensive meal – the bill was $117 without the tip. But the food was excellent; the service better; the atmosphere delightful and although full and the noise level high, it was not so high that we couldn’t hear each other well. It is an excellent place to celebrate good things happening to good people. Thanks for the review. I’ve peeked in there many times on my walk to The Jenna Druck Center. It always looks a lot happier in the restaurant than it is upstairs.